A deeper look at the grooves pressed into a vinyl copy of David Live 2LP by David Bowie. Such powerful language as that above demands an examination of the album, doesn’t it? 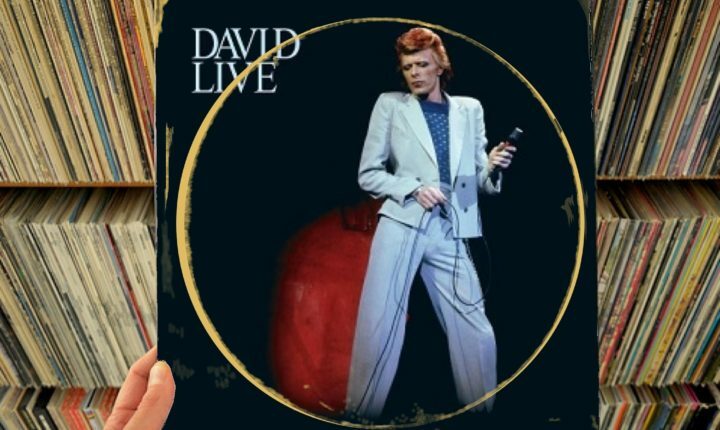 It’s for that reason Ground Control will attempt to get to the bottom of David Live – not the reissues which appeared in 1990 or 2005, the original vinyl release as it arrived in 1974. In spite of the tremendous number of criticisms that David Live has taken since its first release, it’s hard to not get a little starry-eyed as “1984” (from Diamond Dogs) opens the album. There, the song instantly grabs and holds listeners’ attemtion thanks to a very urgent, wah pedal-driven performance by guitarist Earl Slick. Simply said, everything about the pop cultural image of the Seventies – Shaft‘s theme song, rough and ready rock, Raw Power and Soul power – are all encapsulated and thrust in listeners’ faces. The results are dazzling and perfectly sets up the star of the show’s entrance. As a time piece, it’s really, really cool to hear Bowie’s first appearance on this album. Of course, much has been made of the singer’s substance abuse problems during this period (every fan has seen footage of Bowie sniffling and his nose perpetually running down to his knee from cocaine use and god knows what else) but, in this performance, it does not affect the singer in the slightest. On “1984,” he steps out boldly, sounding like he’s ready to rock the world. And then a very tight, urgent and short performance of “Rebel Rebel” follows “1984” and just rocks the pants off of listeners. In retrospect, the force with which both band and singer knock out the version of “Rebel Rebel” which appears on David Live is jaw-droppingit suits the “Phillie Soul” angle that the singer was playing with at the time in an abstract sense, but it really stands out – even among other performances here which do rank as solid and impressive. After the two minutes and forty-three seconds (roughly half the time it takes to play through the song’s studio counterpart) that “Rebel Rebel” takes to play through here though, the momentum immediately downshifts for a rendition of “Moonage Daydream” which masterfully straddles the lines between reggae and soul (translation: “It’s a love-it-or-hater-it presentation”), before all three parts of “Sweet Thing” (that’s “Sweet Thing,” “Candidate” and (“Sweet Thing (Reprise)”; if readers are unfamiliar) are assembled and play out gently to close the side. After the A-side closes is when things get a little unusual. The original pressing of David Live features the D-side backing the A-, with the B- and C-sides collected together on the other record in the set. Why? In 1975, some record players were capable of playing many discs in a stack and revolving them so they’d play in the correct order. Is that confusing? Forty-two years later, it would be easy to understand how such an arrangement would seem ridiculous – so for this review, the sides will get covered in the proper order (A,B,C,D) and not in the order in which they appear (A,D,B,C) in the name of keeping things simple and having them make sense. On the B-side of David Live is where listeners will begin to really discover how misplaced the criticisms of Bowie’s habit of rearranging old songs for the sake of new characters and new presentations really was. Right off the top, as pianist Mike Garson patters out a flourish of notes, bassist Herbie Flowers and drummer Tony Newman build and exciting and muscular rhythm figure on top of which Bowie begins breathlessly crooning the first verse of “Changes” – but it only falls together when the band reaches the song’s first chorus. It is during that first chorus when the band just erupts , and the results are breathtaking; this fresh arrangement is both fantastic and fantastically lush – similar to the original but gloriously not the same. Even frty years later, it still sounds unbelievably good and “Suffragette City” (which follows the song in succession) keeps pace, brilliantly; these performances are absolutely essential. After that, listeners will find they’re up for anything – even a sort of worldbeat rethinking of “Aladdin Sane” and a positively enormous cover of “All The Young Dudes”i – before finally arriving at a jazz-infused and dramatic version of “Cracked Actor” which closes the side. Overall, those ever-so-slight variants on established hits continue to have a pretty divisive effect with fans. Some thrill to the “not quite the same as the studio” results because they exhibit a very human and of-the-moment touch that only a live show can really promise. However, because some listeners prefer the “human jukebox” approach to live shows, it’s understandable how the reworkings could put them off; they’re good, but they’re not necessarily what anyone would immediately expect. The C-side continues the “not exactly like the studio” trend as “Rock ‘n’ Roll with Me” opens the side even slower than the studio track played. Mike Garson adds a few extra flourishes, but the effect is still an undeniable lull which “Watch That Man”tries and fails to break. It’s only when Bowie launches into a cover of “Knock On Wood” that the band really begins to show signs of life again, and the true redeemer is a stomping, swinging variant of “Diamond Dogs” – but that comes a little bit late in the game. To its credit, the horns included on “Diamond Dogs” – particularly the sax supplied by David Sanborn – really enrich the track and make the backing vocals which were very clearly added in post-production [as noted in the liner notes – apparently there was a loss of mic contact which was rectified after the fact) totally permissable. Needless to say, the C-side of David Live is the take-it-or-leave-it bit in the set; it’s okay, but could easily be overlooked due to far greater and more absorbing spectacles elsewhere. Finally, those who make it to the D-side of David Live (those who go front-to-back with an original pressing eventually begin to understand why a more truncated version of the album was pressed as a single disc and released under the name Rock Concert by RCA in the Netherlands in 1979) will discover a antastic final act where the rethought arrangements work really, really well. First, “Big Brother” breaks through with a perfect prelude to what would be coming from Bowie in just a few months’ time on Young Americans with its sweet, rolling Soul sound, but it also features a “Rock N’ Roll Genius” guitar figure from Earl Slick which is the most gratifying aspect for the stage. Thanks to Slick, listeners will feel their faces being melted, even decades later – a sensation which is carried over into the more bombastic and enormous take of “Width Of A Circle” [which overshadows its studio-borne counterpart –ed] and the take of “The Jean Genie” which is far more sly and holds back to make listeners rush forward, begging for satisfaction. After those explosions, it’s easy to tell that the audience is spent for their effort but, perhaps sensing that, Bowie and the band lay up through the side-closer, “Rock ‘n’ Roll Suicide,” to let them savor the afterglow. Now, it could easily be said that the soft ending of the final track on David Live is a cop-out – audiences want an explosion to end their night, a climax – but those who play through the whole album know better.This end is sweet and low and gives those who play along a chance to feel a bit of intimacy; it’s easy to hear that the audience at the show was feeling that sort of serenityby the small sounds they make through the end and, when the song closesthe final resolve is perfectly gratifying. This end can leave listeners of the right mind perfectly doe-eyed.